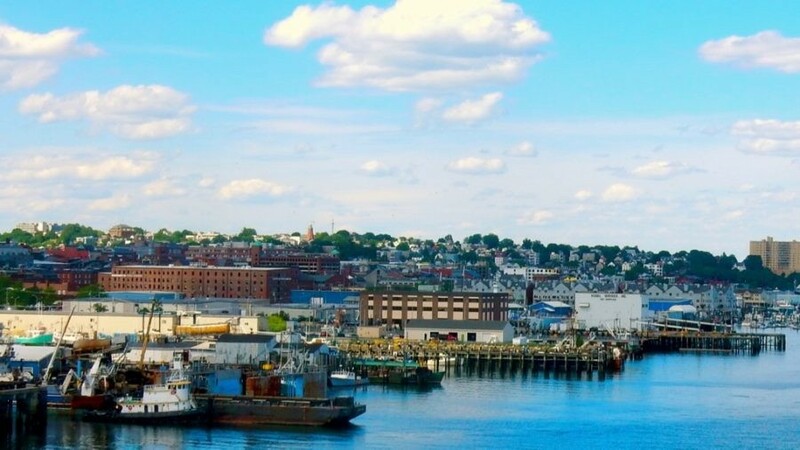 WHY GO: When I first wrote about Portland ME ten years ago, this working port on Casco Bay was a laid-back town with a “mellow vibe.” But now it’s crazy busy, especially in Old Port by the waterfront, where uneven cobblestone streets make ambling a pleasurable challenge. There are a gazillion places to eat, catering to both the gastronome and tourist trades, and it’s not just the chow. Portland is known for it’s brews as well: Shipyard Brewery and Allagash most notably. But Portland has its cultural side. The poet, Henry Wadsworth Longfellow was born and raised here, and Winslow Homer had his first exhibition at the Portland Museum of Art – in 1893. There’s so much to do in Portland – here’s how to maximize your time. TOUR: Portland Discovery Tour with Portland Head Lighthouse stop. Traffic is nutty in this city – and so is parking, which is nearly non-existent. And when you do find a place, take it from me, you’ve got to move your car every 2 hours or pay the consequences. Best to hop on a city orientation tour that does not involve your own vehicle, is less than 2 hours, and optimally, has an engaging driver-guide. You’ll find those requisites with Portland Discovery Land and Sea Tours. 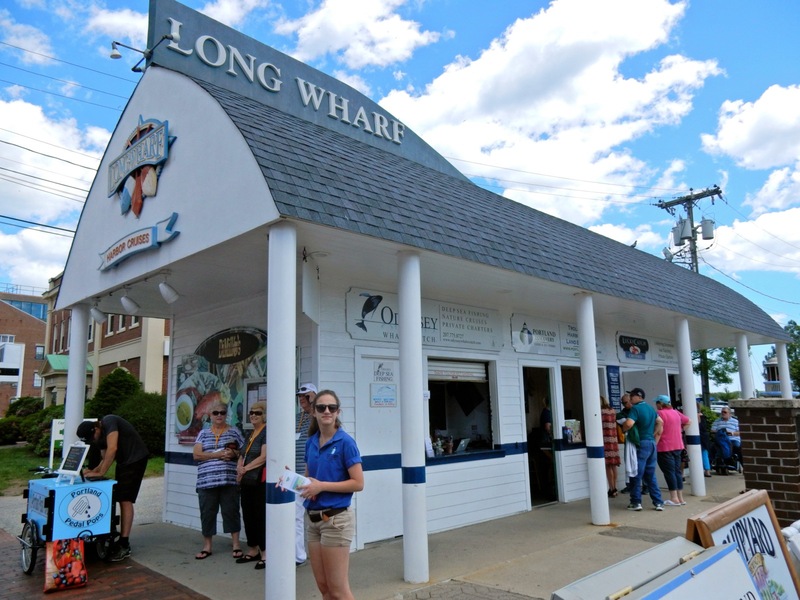 Its kiosk is on Long Wharf and Commercial St. next door to Portland Lobster Co. First timers who are also passionate about lighthouses, will want to take the 1 hour 45 minute city and Portland Head Light tour. 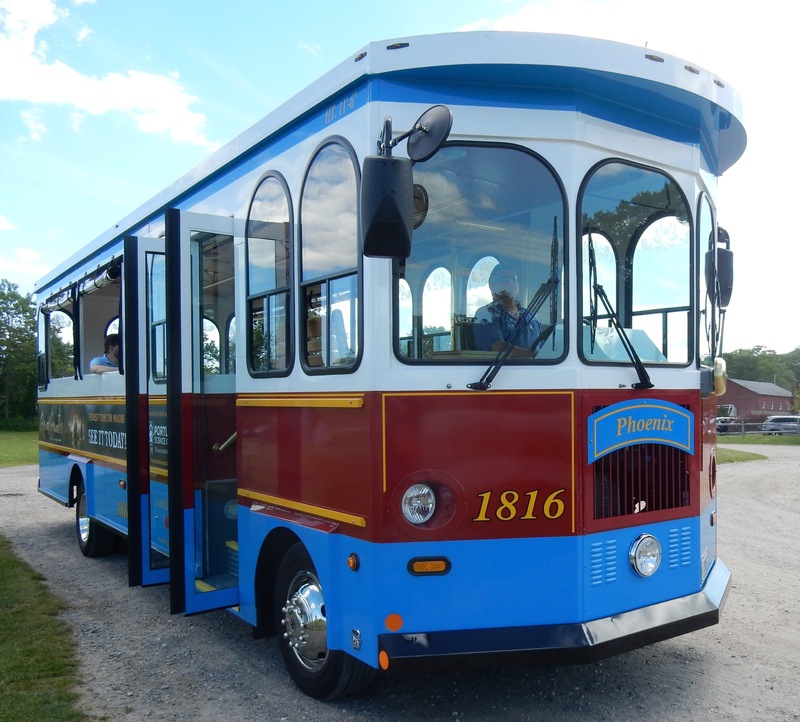 Yes, it’s a hokey trolley tour, with somewhat jokey and homespun narration. But it covers a lot of ground, especially if you don’t have much time. Commercial Street is the primary route on the waterfront – a mélange of working and recreational boats, condos, restaurants and bars. Portland Harbor is one of the busiest ports in North America; with a couple of cruise ships sailing in and out of Gateway Terminal daily in season and tankers offloading oil into clusters of oil receptacles – called “tank farms” – that dot the shoreline. During WWII, 236 Liberty Ships were built right here, mostly by armies of women who collectively came to be known as Rosie the Riveter or Wendy the Welder. The Ferry Terminal is busy with boats going to and from the inhabited islands in Portland Harbor. Over 1,000 people live all year surrounded by water: island kids take the “schoolbus” ferry to the mainland every day. We lurched by the Maine Maritime Academy Training vessel, which was preparing to shove off to Ireland. You’ll feel as if you can see the Emerald Isle while stopping for a second in a hilltop park overlooking the expansive Casco Bay. From here, you’ll understand why the windmill-like 1807 Portland Observatory (see below), the only remaining signal tower in America, was situated near the top of Congress St. on Munjoy Hill – an Italian and Irish neighborhood with some great eats, like the comfort-food hit, Front Room Restaurant. VISIT: Fort Williams Park/ Portland Head Lighthouse. The Portland Head Light guides sailors from its perch on a promontory at the entrance to Portland Harbor, and sits at the terminus of a mile long cliff walk within the magnificent waterfront Fort Williams Park. In 1787, President George Washington commissioned the construction of this caisson-style lighthouse, which was completed in 1790 and is now the most photographed lighthouse in America. For good reason. It is breathtaking. 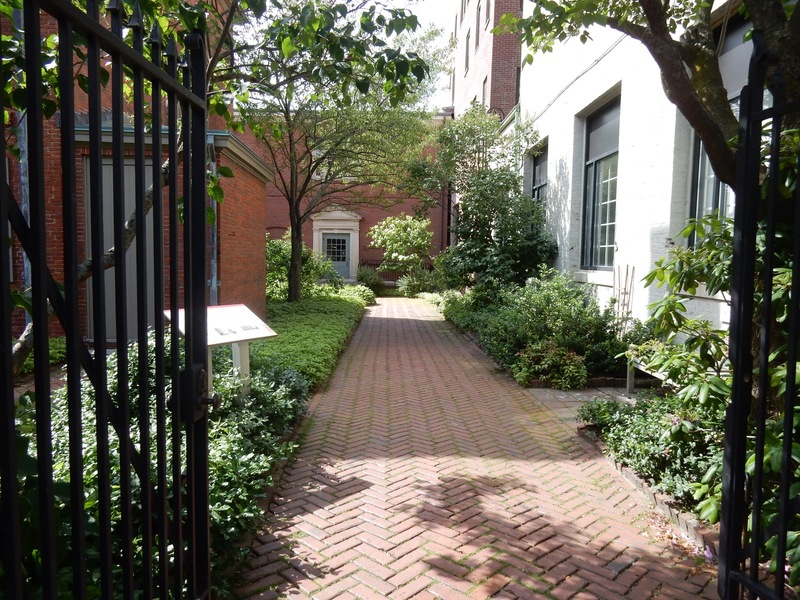 TOUR: Wadsworth-Longfellow House. When Henry Wadsworth Longfellow’s younger sister, Anne, passed away in 1901, she left the house and all of its contents – from three generations of Wadsworth-Longfellow’s – to the Maine Historical Society, founded in part by her father, Stephen Longfellow in 1822, stipulating that the Society’s library be built on the property. It was, in 1907, and remains separate from the historic home, which you can now tour. Henry was born to Stephen Longfellow and Zilpah Wadsworth in his aunt’s home on Fore St. in Portland. (Zilpah’s sister’s husband was away at sea, and she and Stephen were helping her out). A few months later, the Longfellow’s moved, with baby Henry and two year old Stephen, into Zilpah’s parent’s home, had six more children, and raised them all in this three story brick Georgian-style house. If you’re lucky, you’ll have John Babin, author of Henry Wadsworth Longfellow of Portland, as a tour guide. Far from a dry recounting of the poet’s history, Babin is a storyteller with a fount of knowledge about the man who most famously penned Paul Revere’s Ride. “Come listen my children and you shall hear…” of the antics of one of America’s favorite poets. Henry wrote his first published piece at the age of 13 – based on a story he heard from his grandfather about a Revolutionary War Battle. He slipped the poem, signed only “Henry,” under the door of the Portland Gazette and it was published in “The Poet’s Corner” – and later slammed for being “remarkably stiff” and “mostly borrowed.” The poet obviously learned from his mistakes. 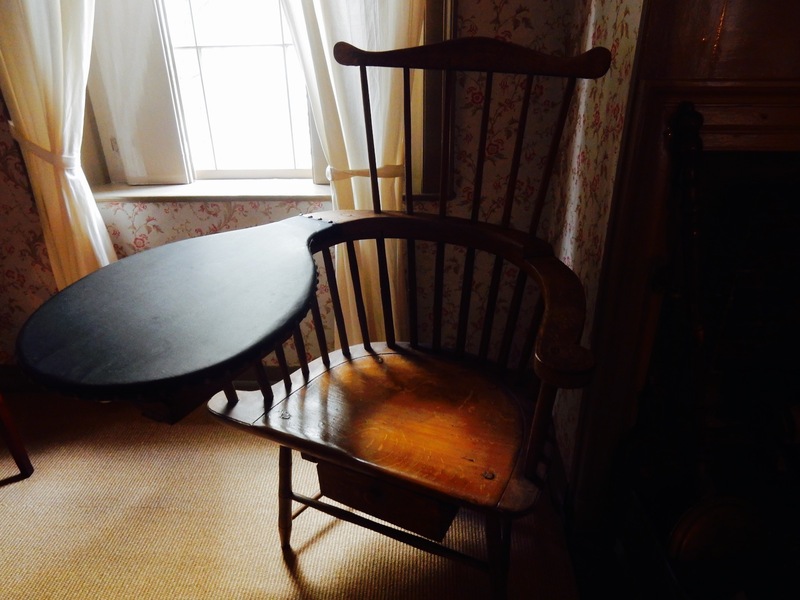 One of the joys of touring a writer’s home, especially for Lit Lovers like myself, is the thrill of being within reach of objects important to said writer – childhood toys, furniture, writing desks, especially. The rocking horse that Henry loved remains in its original place in the kitchen. The table at which Henry did his homework when he was seven, in the dining room that Stephen converted into his law office, is still there. Even Henry’s boyhood desk, to which he returned again and again even after he moved out, is on display. Henry found inspiration whenever he came home to visit his parents. Upstairs, a meticulous sampler, embroidered by Zilpah Wadsworth, age 8, in 1786, hangs on the bedroom wall near a rare 1775 armchair desk that belonged to her father, Peleg Wadsworth. Henry graduated High School at 14, went to Bowdoin College and stayed to teach there at 22, and later, after traveling through Europe to study foreign languages, at Harvard. He married twice; his first wife, Mary, died of a miscarriage at 22. (While in mourning, he wrote the poem, The Rainy Day, with the famous line, “Into each life some rain must fall”). He and his second wife, Frances “Fanny,” had five children and grew old together. Henry’s sister, Anne Wadsworth’s, story was a somewhat sadder one. She married George Washington Pierce at 22, and returned home a widow at 25. She never remarried and never had children, choosing instead to take care of her parents, her Aunt Lucia and younger siblings in this home. She always felt the house belonged to the public, and lucky for us, she left it and its intimate garden, in admirable condition. $15, May 1 – May 31: Monday-Sunday 12pm-5pm., June-October: Monday-Saturday 10am-5pm. Sunday: 12pm-5pm. VISIT: Portland Museum of Art. Winslow Homer first exhibited here in 1893, and since then this human-scale world class museum has focused on American/Maine artists, American and French impressionists, contemporary art, and the decorative arts. DO: Take a tour of Winslow Homer’s studio at Prouts Neck. Homer was the consummate Maine artist, capturing the essence of maritime and town life in the nation’s most Eastern state. For a limited time in spring and fall, only ten people are allowed at a time to see his preserved studio and inner sanctum. Tickets must be booked through the Portland Museum of Art. Obviously, this sells out in advance- so book quickly. $55 per person seasonally, 207-775- 6148. DO: Sail on a Windjammer. To get a sense of what the captains of yore must have experienced gliding into pristine Casco Bay, arrange for a two-hour Windjammer sail on either the Baheera or Wendameen – stately tall ships built in the early 1900’s and recently restored. Daily, May – Labor Day; four departures per day, $44 adults, $15 children. DO: Haul Lobster Traps. Go out with the crew of the Lucky Catch, and get a voucher to take your live Lobster to the Lobster CO on the pier where they’ll boil it up and add side dishes to eat while you watch lobster boats come and go on Casco Bay. The crew of the Lucky Catch discuss sustainable harvesting of Lobster, recount the history of Portland Lighthouse as you motor by, and offer a lot of lobster lore and local history. 90 minutes, May – October; $30 adults, $28 youth, plus wholesale price per pound of lobster if you’d like to take or cook your haul. STOP IN: Len and Libby Candies, Scarborough. In operation since 1929, Len and Libby Candies made it onto the tourist map when “Lenny” moved in. “Lenny” is a moose formed out 1,700 pounds of fine grade milk chocolate, sculpted in four weeks on site by an art professor from University of Maine and unveiled on July 1, 1997. For almost 20 years, Lenny, standing in a “lake” of white chocolate tinted blue, has not melted or become deformed thanks to the air-conditioning that keeps all candy, including the shop’s signature confection, Bangor Taffy (caramel rolled in powdered sugar), intact. Miranda grew up in the Monjoy neighborhood, and as a kid would visit the Eastern Cemetery nearby. There, he was obsessed with the above ground box tombs of two young ship Captains, Captain William Burrows (American), and Samuel Blyth (British), who died in battle during the War of 1812 just off the coast, and were interred side by side. The officer’s portraits, renderings of sailing ships, and other nautical paraphernalia cover the walls in homage to Portland’s maritime history and these men. But make no mistake. This place is so serious about crafting mixed drinks, you’ll find three eye-catching bars (soon to be four) on several levels. Of course, you can get a craft-draft, but opt for a custom-made or snappily-named concoction – such as “I Like the Cut of Your Jib,” ($12) with rye, scotch, pine liqueur, lemon sherbet and sea smoke bitters, or “Death Stalker,” a deadly blend of mescal, tequila, yellow chartreuse, mango, chili, and lime. There’s also a pub menu as befits a funky Maine bar – with Peruvian Ceviche ($11), Lobster Roll ($18), fresh oysters and more, to accompany your liquid refreshments. And yes, there is an actual speakeasy here – a “secret room” (another bar) downstairs, accessed either through the bookcase-door, or through the street-level graffiti’d back door flanked by garbage cans. Soon, there will be a more sedate, low-lit Victorian parlor downstairs as well. From the looks of it on a June mid-week night, Miranda’s wish for Blyth & Burrows to be Portland’s new hotspot is coming true. EAT: A James Beard winning restaurant named Fore St. led the foodie revolution in Portland. But that was so ten years ago. Now, with JB winners left and right, it’s tough to choose. Locals love Eventide, Honey Paw, and Central Provisions for small plates and open kitchen, Front Room Restaurant and Kitchen in the Monjoy Hill neighborhood, for upscale comfort food, Novare Res – considered the “Best Beer Bar in Maine,” and according to Nick Cote, a 22 year old cabin boy at Migis Lodge who has lots of chef friends and “knows almost everything about Foodie Portland”, the Thirsty Pig – for homemade sausages and its Millennial scene. “Downscale” favorites include Holy Donut – made from potatoes, Otto Pizza, and Empire Chinese Kitchen. BREAKFAST: Becky’s Diner . Fishermen and locals have been besotted with this hole in the wall for years; you’ll find everything from raved-about blueberry pancakes to twin lobster dinner. Come at 4am when Becky’s opens daily, and you just might find some room amidst the commercial fisherman getting ready to head out for the day’s catch. SNACK: Duckfat. If your heart can handle it, waddle to hole-in-the-wall Duckfat, 43 Middle St., and order the fries crisped in, yup, duckfat. Save up all of your cholesterol allowances for this one afternoon. It’s worth it. EAT: Sea Glass Restaurant at Inn By the Sea, Cape Elizabeth. If you choose to bunk at the luxurious, ocean-side Inn By the Sea, you don’t have to go far for some of the best food around. It’s sea-to-table dining in direct view of said Sea, and not only do the chefs know what they are doing (and then some), but wait-staff is bend-over-backwards nice. 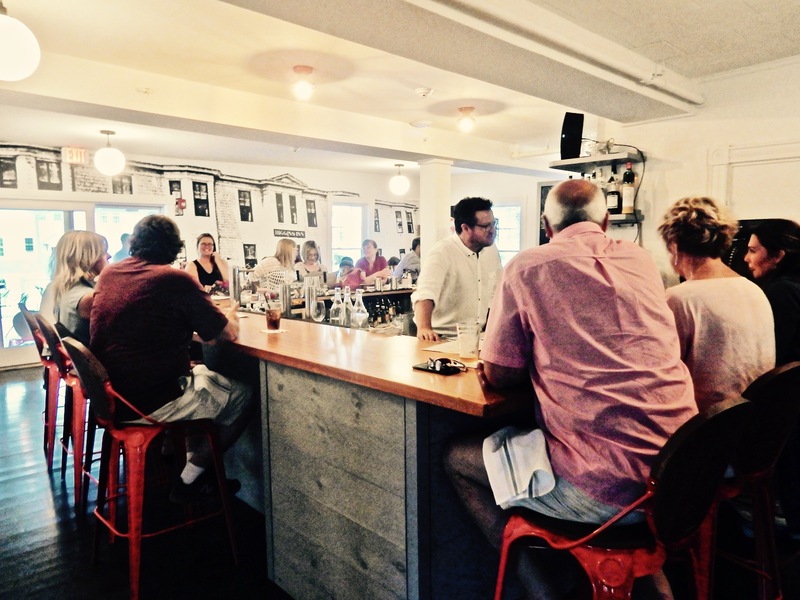 EAT: Shade at Higgins Beach Inn, Scarborough. Another just opened hotspot in a faded-to-fabulous beach neighborhood hotel, just 15 minutes from downtown Portland, Shade has got it made. 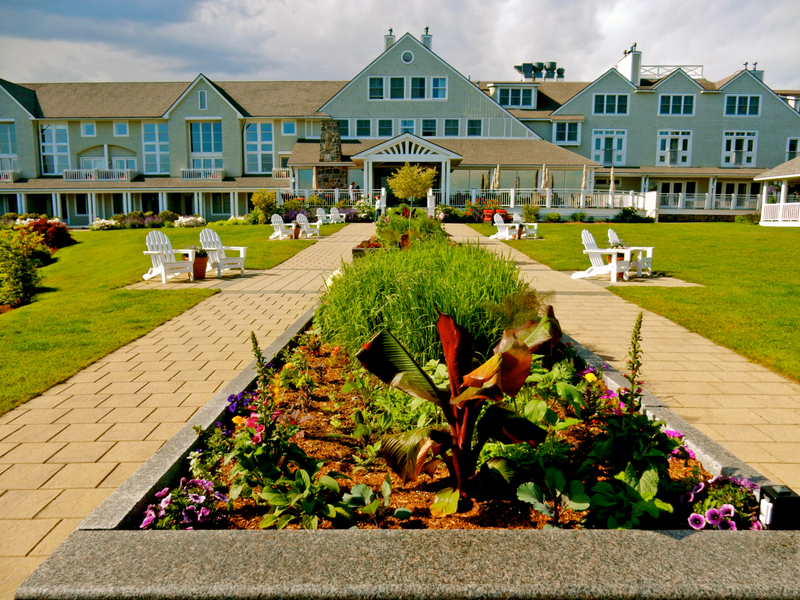 STAY: Inn By The Sea, Cape Elizabeth. 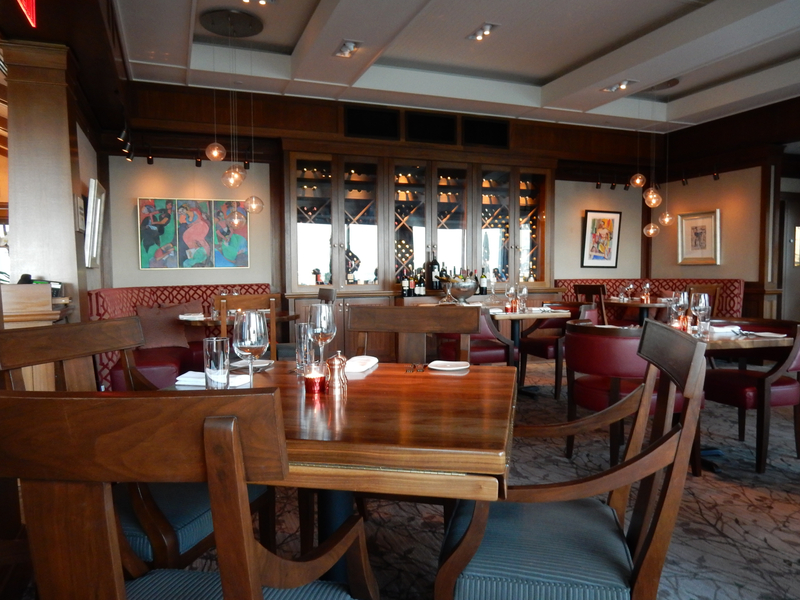 Ten minutes from Portland, Inn By the Sea is a Maven Favorite with full write-up HERE. 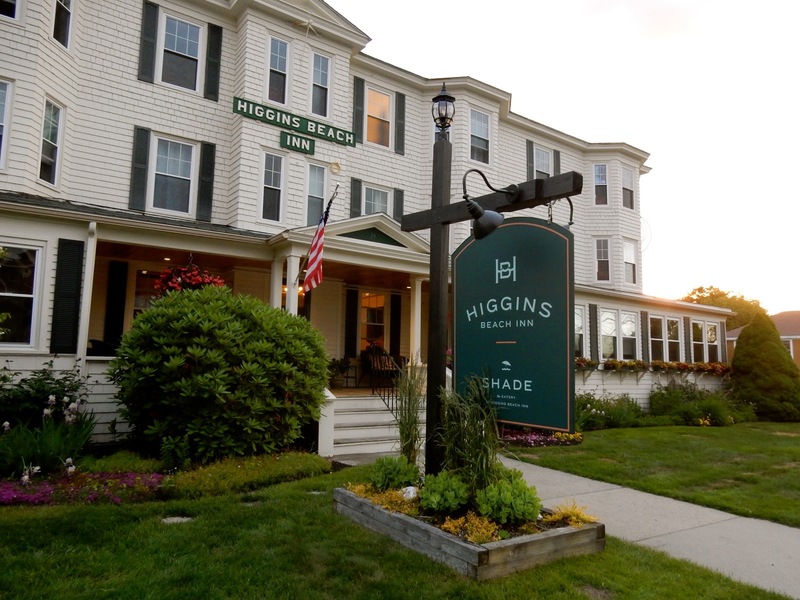 STAY: Higgins Beach Inn, Scarborough. 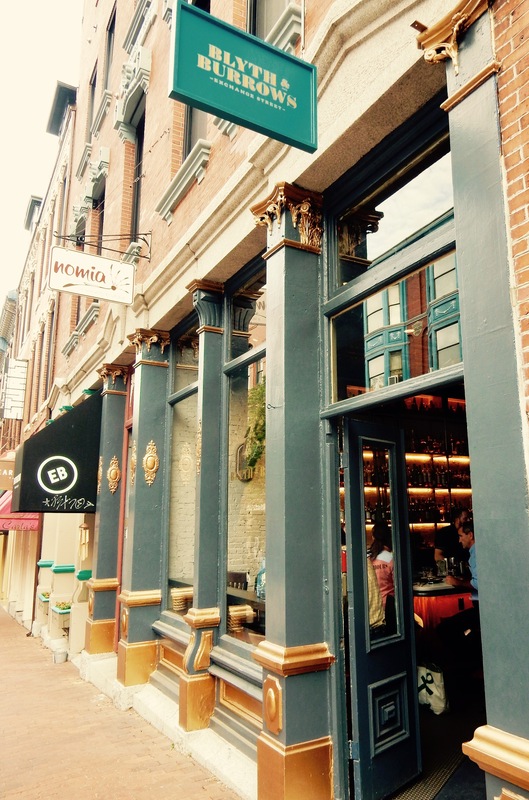 Another Maven Favorite, about 7 miles out of town, and just opened after a faded to boutique renovation. Read the complete write-up here. Located off Interstate 95, Portland, Maine is 2 hours from Boston and 5 from NYC by car. 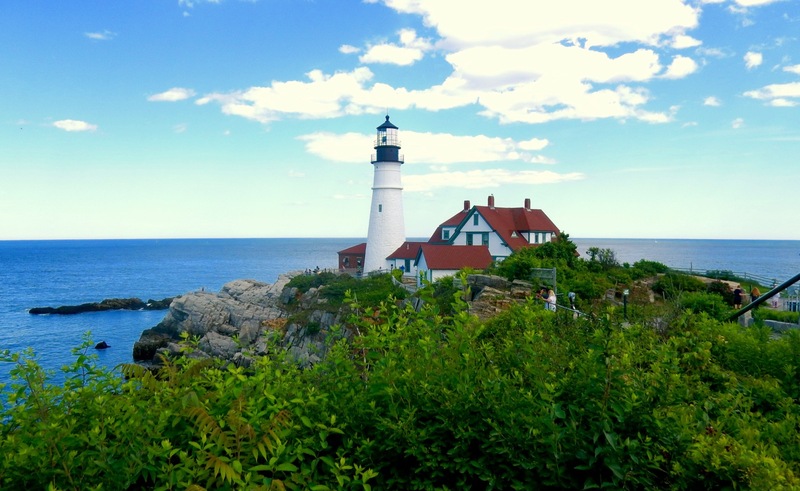 It’s also easily accessed by Amtrak train from Boston and other points on the Downeaster route, as well by bus–Concord Bus connect Portland to several New England cities–and by ferry, as Casco Bay Lines provides regular ferry service to nearby islands.